Tom Livingston, President of the Village of La Grange, reflects with fondness on the Stone Avenue Train Station. “My father took the train out of this station for forty years. It’s a real workhorse…” However, time had taken a toll on the century-old station: rusted gutters, rotting wood, peeling paint, a deteriorated roof. The workhorse needed mending. In 2005, the village launched a restoration effort that would truly take a village to pull off. It would require the input of a wide range of resources, ranging from village officials to legislators, railroad representatives, and community organizers. On a warm October morning, Livingston and the La Grange community celebrated the project’s completion. The 900-square-foot station, with its locally quarried limestone and bold arches, now gleams with as much charisma as it did when it was built in 1901. The village secured funding for the anticipated $1,085,000 project through two primary grant sources: Congressman Dan Lipinski ($700,000 grant) and the West Suburban Mass Transit District ($385,000 grant). The project was competitively bid and awarded to Boiler Construction of Waukegan in 2013. Congressman Lipinski had seen old stations demolished, then replaced by new stations that looked similar to the old ones. He said, “The Stone Avenue station is a cherished part of the La Grange community and I didn’t want it to meet a similar fate.” The Way it Should be To help research and reignite the station’s historic charm, the village and Legat Architects enlisted the assistance of the La Grange Area Historical Society. LAHS uncovered the station’s original 1901 plans which it received from the Burlington Route Historical Society. “These were used to help guide the renovation design,” said Assistant Village Manager Andrianna Peterson. “The team also studied the society’s collection of early postcards and photographs of the station’s historic features.” The unearthed documentation influenced material and fixture selection, including the identification of period correct light fixtures outside and new chandeliers inside. Additionally, the team replace the plain aluminum doors with aluminumframed oak doors repainted with historically accurate colors. “The project focused on preserving the look and feel of many of the station’s beautiful historic features,” said Rohde.” For instance, the restoration fixed the rotting dentil molding along the roofline and replace the old beadboard on the outdoor ceilings with stained oak beadboard.” Designers also had to be respectful of the village’s budget and maintenance constraints. There was a careful balance between choosing affordable contemporary materials and creating authenticity. For instance, one hundred percent recyclable and curable polymeric slate roof tiles replace the damaged asphalt shingles. The new tiles are a costeffective alternative to traditional slate and require much less maintenance. The tiles are also appealing. “When you look at the roof,” said Rohde, “you see subtle color changes based on your perspective and the position of the sun.” The project scope also addressed the historic platform signage. Legat used the 1901 station plans to recreate the design of the platform sign. Additional repairs included landscape improvements (design courtesy of the La Grange Garden Club and Hitchcock Design Group) to make the station more inviting with beautiful, yet accessible outdoor spaces. A Community Constant The Village of La Grange has a long-standing tradition of preserving its past. Turn-of-the-century homes in many styles enrich its large historic district. The thriving downtown includes a tapestry of buildings dating from the late 1800s. In the last century, the village has transformed from a quaint shopping town to what Livingston calls “a transit-oriented, vibrant downtown.” Indeed, the village has been fortunate to receive several recent accolades including one of the “Best Places to Live and “Best Downtown” by Chicago magazine and “Top Transit Suburb” by the DePaul Chaddick Institute. 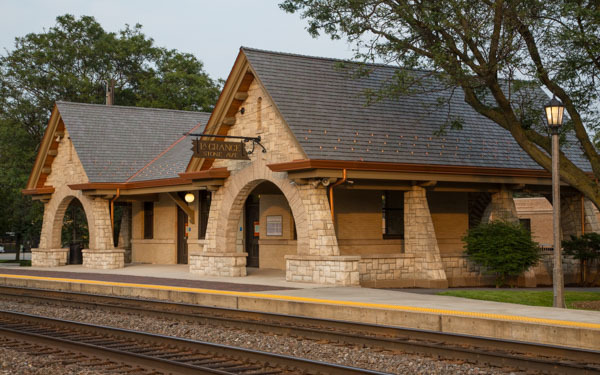 La Grange residents continue to embrace the iconic Stone Avenue Train Station; its serves almost a thousand commuters each day. “Everyone keeps saying how beautiful it is,” said Andrea Barnish, resident and chairman of the Design Review Commission, which was consulted on the station’s upgrade. “It’s nice to see it was restored and not replaced.” Curtis Linder, resident and Treasurer of the West Suburban Mass Transit District said, “it’s a dramatic improvement to an architectural gem.” The workhorse is back on track. Communications Manager: Chicago-basedLegat Architects, which served as the architect of record for the Stone Avenue Train Station restoration.